The railways of Britain were privatised on 1 April 1994. As ever with the privatised railway, any simple statement like that one covers a much more complicated underlying meaning. In fact, most of the railway remained in public ownership, but a new structure was put in place with the intention that the elements within it would be sold off over the next few years, as indeed they were. Infrastructure owner Railtrack was floated on the London Stock Exchange in 1996, while the 25 passenger train operating units were franchised out to the private sector by 1997. In the run-up to privatisation, an unexpected by-product of prime minister John Major’s surprise 1992 election victory, there had been various suggestions for the way the railway could be restructured. One popular suggestion was a return to something like the ‘Big Four’ railway companies – LNER, LMS, GWR and Southern, which had preceded British Railways; a perceived (if not actual) ‘golden age’ of the railways. Another was the privatisation of British Rail’s main business units as large companies: Intercity, Network SouthEast, Regional Railways and so on. In the end, a complicated structure involving an infrastructure operator, the 25 train operating units, several freight train operators, three train-owners (as opposed to operators) and various legal oversight bodies was the chosen solution. We’ve already seen that most of the freight train companies were bought by English, Welsh and Scottish Railway, which introduced a corporate identity based on that of its parent company in America. That new look wasn’t exactly welcomed by the designer of the triple-grey Railfreight corporate identity which it replaced (see the end of this earlier article). But what of the passenger train operators? In the end, their corporate identities were divided between modern new looks applied with varying degrees of effort, faux-nostalgia, mould-breakers (brilliant or otherwise) and complete denial that British Rail had been privatised at all. In other words, the full gamut of public opinion on railway privatisation was to be found in the way trains looked. 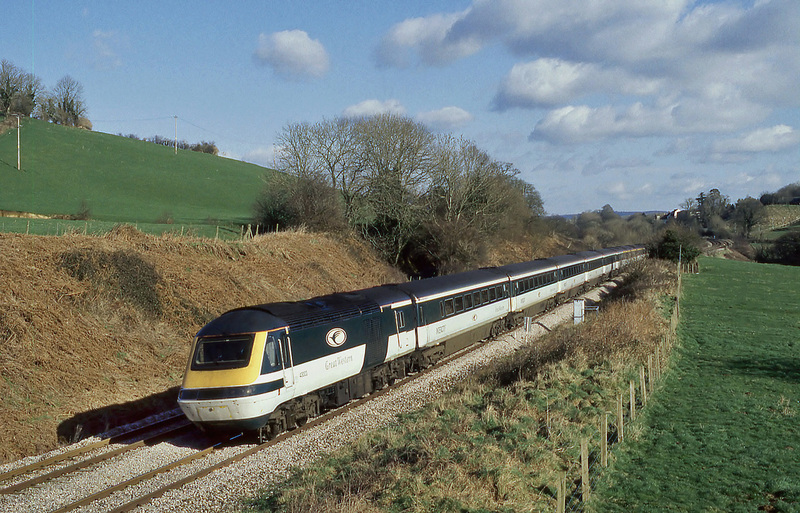 There had been a degree of expectation that the Great Western Trains franchise operating trains between London and South Wales/Cornwall might recreate the chocolate-and-cream colours of the pre-British Rail Great Western Railway, as railway writer Christian Wolmar acknowledged here. It wasn’t to be. Instead the company chose an ivory and dark green colour scheme with a bizarre-looking oval bird logo when it unveiled its new look in 1996. Very sweetly, the company also completely misread the mood of the new privatised railway by carrying the pre-privatisation “INTERCITY” wordmark on its trains (you can see it via this link if you look closely). In the run up to privatisation various commentators had expressed the hope that the new structure would see intercity operators cooperating to retain a consistent Intercity network. Not a chance. Great Western Trains registered the pre-privatisation Intercity wordmark as a trademark, to a complete and utter lack of interest from any other intercity train operators. It soon disappeared even from Great Western Trains itself. The new reality of the privatised railway was there for all to see in terms of corporate identity: there was to be no cooperative effort between operators to retain the feel of a national network. The baby, and the Intercity wordmark, was being thrown out with the bath water. If some train operators seemed to be clinging desperately to a few comforting elements of the old nationalised railway industry, others seemed to be in complete denial that privatisation had happened at all. For its first post-privatisation visual identity, Gatwick Express replaced the red stripe of the British Rail Intercity colour scheme on the side of its trains, with…a slightly narrower maroon stripe. I doubt anyone but hardened rail-geeks noticed. For Chiltern Railways, even this degree of change was too radical. It went out of its way to retain the British Rail Network SouthEast corporate identity as much as humanly possible. The trains stayed in Network SouthEast colours, stations retained their Network SouthEast signage, red lamp-posts and NSE-standard digital platform clocks, while publicity and information posters appeared unchanged from Network SouthEast days. It was as though privatisation was something that was simply happening somewhere else, and that pretty much accurately reflected the wishes of many people within the railway industry itself. I wonder if an unusually large number of them were concentrated at Chiltern Railways, which had after all done very well for itself under Network SouthEast, and that explains the attachment. Ironically, it was Chiltern Railways that broke the 1,064 day drought in new train orders that the disruptive privatisation process had caused. Yet when the first post-privatisation trains arrived, they were painted in colours identical to those of the old Network SouthEast, arranged in a very similar pattern. It wasn’t revolution, and it was barely even evolution. What Chiltern Railways did change was the typeface for its logo. British Rail had standardised on Rail Alphabet for many years. Although there had been some breakaways in its last years with the parcels business using Frutiger and Intercity using an all-capitals italic font, practically every other piece of lettering on the railway remained in Rail Alphabet. Chiltern Railways, along with most of the other new operators, introduced an approach which has plagued the privatised railway ever since, at least for those of us who like a bit of typographic consistency. Its new logo was in a new font, but most of the remaining lettering at Chiltern Railways remained in Rail Alphabet. To this day, you’ll find a most peculiar mix of typefaces at many train operators. Only one train operator made a serious effort to hark back to the ‘glory’ days of the pre-war steam railway, with GNER calling on the talents of design house Vignelli Associates to create an entirely spurious historical ancestry for itself in the hopes of capturing some of the glamour of a long-vanished world. Its initials sounded vaguely ye olde railway, and it used a mediæval-looking coat of arms. To an extent it worked, fooling many into believing that a train operator that looked as though it was from the golden age of the railway would deliver a golden level of service, as this earlier article explains. This approach to corporate visual identity, which many had expected the new train operating companies to pursue, turned out to be unique to GNER however. Virgin Trains surprised us all. Fanciful mock-ups by the national press of Virgin Trains proposals in the run up to privatisation had led us to expect an identity like that of Virgin Atlantic’s aircraft, i.e. mostly white with red highlights. But Virgin Trains instead used a somewhat sombre identity of dark grey carriage ends with red inners. Its typeface at the time, from memory, was a slab serif which lent a heavy look to proceedings, quite unlike the fleet-of-foot Virgin Atlantic operation. It would take until the introduction of the Pendolinos before we got what we expected from Virgin Trains. Other train operators seized the opportunity to create visual identities new and different to anything that was seen in British Rail days. Whether or not you liked the result, it was hard to deny that such train operators were trying to come up with something specific to their local market in a way that British Rail’s subsidiaries had never really managed. Inevitably, your enthusiasm for any particular visual identity was dictated as much by personal preference as any impartial measure of its success or appropriateness; this remains a common problem around the discussion of transport company visual identities to this day. Central Trains commissioned a subtle but very attractive visual identity from transport design agency Best Impressions. ScotRail ended up with an identity which was both very Scottish, being based on the geography of the country itself, but also very fresh, eschewing simple stereotypes like tartan or Saltires. For what it’s worth, I thought less successful approaches could be found at Anglia Railways, where the visual identity was underwhelming, and messy in its application to multiple unit trains, and Northern Spirit. Its “Big N” identity and ridiculous Ladybird Books-style typeface, in various colourways, were particularly brash, especially a mid-blue and lime green version (though it’s an identity admired by others – see the comments section on this TransportDesigned article). But that was nothing compared to what Martyn Cornwall Design came up with for North Western Trains, which went for a house colour of dark blue decorated with big gold stars. It was probably one of the unhappiest individual brand identity of early privatisation, managing to look slightly ridiculous and drab at the same time. Four stars lined up across the doors of carriages. But why? It certainly wasn’t an interstellar service. It wasn’t even a four-star service. Such radical breaks with tradition were, however, music to the eyes (er, ears…sorry, that metaphor got away from me a bit) of those whose vision of railway privatisation was the complete expunging of British Rail. These new identities were the Year Zero approach. Maybe I’m being harsh, and perhaps I’d remember the North Western Trains identity more favourably if it had been applied to a more dynamic train operator. We’ll never know exactly how much the localised identities that privatisation led to were responsible for the changing fortunes of the passenger railway. But while privatisation had been undertaken on the expectation of managing a slow decline in passenger numbers, what actually happened was that passenger numbers increased. Of course, there were some companies which didn’t want to play ball. French-owned Connex had without doubt the worst corporate identity of them all. It settled on plain white for its trains, relieved only by a band of colour at the bottom of carriages – and that colour was grey on its fleet of new trains (yellow stripes on its older ones, mismatched due to colour variations in the vinyls used to apply them); a colossal missed opportunity. White is difficult to do well on the railway, and probably only intercity or international operators had the time and management focus to plan regular enough train cleaning in the years following privatisation. Connex, on the other hand, certainly did not, and its trains eventually dirtied down to grime grey. While people will probably forever argue about the extent to which passengers care about what colour their trains are, in comparison with whether they run on time, I like to think that the hatred that Connex generated amongst its passengers (and many of its staff, I’m afraid to say) was in part because its trains did absolutely nothing to appear as though they were part of a high-quality operation. Admittedly, those trains were also not very good at time-keeping either, so Connex was always on to a loser. While its senior managers were forever promising great things just around the corner, and convincing themselves that they were finally shifting passenger and staff opinion*, in the end Connex was kicked off the British railway network in 2003. Some train operators went for a half-baked approach that summed up the confused and confusing nature of the early privatised railway. If you wanted evidence that fragmentation and lack of coordination were to be the order of the day on the privatised railway, you could find it at train operators that either couldn’t decide what their visual identity should be, or failed to implement it with any degree of conviction. Owning group Prism Rail was a particular offender. Its LTS Rail operation got through a modified Network SouthEast identity, a dreadful plain white with green doors ‘identity’ for new trains, and then an all-purple identity and a renaming as c2c, all in just a few years and without ever seeming to settle on exactly what it was trying to say. Prism Rail’s WAGN operation had a striking multicoloured identity, but it was applied only to selected trains which had been refurbished, leaving the rest of its fleet looking increasingly shabby, or as though Network SouthEast was still operating them, or both. It was a microcosm of the fragmentation that the privatised railway brought. Say what you like about British Rail rail blue, or Network SouthEast red, white and blue, but if you turned up to those operations everything looked the same throughout, sending out a subtle message that there was a single guiding mind behind your travel experience. WAGN and LTS Rail / c2c in its early years exemplified pre-privatisation fears that the railway’s guiding mind would be permanently lost. Wales & West, also a Prism Rail company, was a basket-case operation that had a basket-case approach to its brand identity, for a long time leaving its trains in British Rail Regional Railways colours with inept vinyls used to slap new logos on. After experimenting with perhaps the ugliest individual train livery in recent memory, a ghastly silver/orange/light blue/dark blue clash of chevron-shaped things (on unit 158867, fact fans; see it here), it finally settled on trains painted mostly silver-grey, with blue doors and yellow flashes at the ends. It wasn’t worth the wait. It was hoped that the privatisation of British Rail would lead to new commercial approaches, with the train operators freed from the ‘dead hand’ of state ownership. Some operators really went wild in their enjoyment of these new freedoms, none more so perhaps than tiny Island Line on the Isle of Wight. Whether painting its trains in dinosaur colours was really a smart move or a completely insane one is a question that will never be answered, I suspect. Was it was wise to do so on the oldest trains on the national railway network? And if it was such a good idea, why didn’t the railway stations, timetables and signage get a similar treatment? In this it was like many of the privatised railway visual identities, which didn’t get much further than the outside of the trains themselves. It was good fun for a while, if fractured and confusing, and occasionally worrying, a bit like the British rail industry at the time, which was struggling to find its feet after years of a state-owned existence in the manner of a baby deer. Things eventually calmed down, and the government eventually realised that a hands-off approach was politically undesirable. As it got more involved, the dead hand of state-sponsored design began to insinuate itself into the way the railway industry looked. But that’s a whole big other story. In the meantime, there was one deer on the railway that found its feet very quickly, and for my money, developed the best new visual identity of the newly privatised train operators. It belonged to intercity train operator Midland Mainline, as I’ll explain in a week or two. * You’ll struggle to find this one, but if you can get your hands on the right copy of Transit magazine from late 2001 or early 2002 (I think) you’ll find an interview with the then Connex chief executive Olivier Brousse conducted by, erm, me. It remains a standing joke with the editor, who is now managing editor of Passenger Transport, because the interview tells you that everything is now going great for Connex. In my defence, I was simply accurately relating Brousse’s words, but it didn’t stop the company being dumped from the British rail network not too long afterwards, to the editor’s lasting amusement regarding my enthusiastic write-up. An great summary of the array of hideous liveries that appeared. Although I am one of these strange people who liked the Northern Spirit livery. Particularly the ‘transpennine express’ maroon and gold. Including the typeface! Despite the example of Connex, which you would have thought may have opened some eyes, there are still plenty of railway managers who are absolutely convinced that their passengers and staff love them more and more every day, whereas the opposite is blatantly obvious to anyone not taking whatever tablets it is that they all seem to take. Most railway staff will happily nominate their own TOC’s senior managers as the prime suspects, but I think we’d all accept that the current winner of this particular contest just have to be GTR (a.k.a Southern). Anyway, back onto topic: when it comes to corporate image, liveries (in particular) are a highly personal thing. I don’t, for example, remember any Central Trains staff ever admitting that they liked the dayglow green colour scheme, and I think it’s fair to say that CT truly lost it when they decided the way to identify their ex-NorthernSpirit (TransPennine) class 158 and ex-MML class 170 units was just to stick socking great squiggly white C’s on the end of each vehicle on top of the previous operators livery. GNER was blandly blue with that red streak of arrogance, as anyone who ever travelled STD and had a problem will recall; on GNER, if you weren’t travelling 1st class, you were a nobody with no rights. Their successor NX were grey for a reason on both East Coast and East Anglia (just, indeed, as FirstGroup’s longstanding grey bus livery made such a blatant statement about that organisation). Virgin’s red says “Hey, we want you to think we’re hip and cool and trendy and innovative when in fact we’re nothing of the sort”. That’s another organisation who may well be confusing themselves about how much they’re actually liked – but again, at least they’re not Connex! Or maybe that’s just how one particular not-particularly-hip northerner sees it. Brilliant use of the Lucy in the Sky with Diamonds lyric fragment.